As part of a new research, scientists have stumbled upon a hitherto-unknown major supercluster in the Vela constellation. Currently being called the Vela supercluster, this massive concentration of galaxies comes with a large gravitational force that, astronomers believe, might have a substantial effect on the motion of the 54 galaxies in the Local Group, including the Milky Way. Additionally, it could play a role in the peculiar velocity of our Local Group with respect to the Cosmic Microwave Background. Superclusters have long held the interest of researchers, being as they are the largest and most enormous objects in the entire universe. These structures extend over a total distance of 200 million light-years, with the most famous one being the Shapley Supercluster. Situated approximately 65 million light-years away, it is the largest of its kind in our cosmic neighborhood. Recently, however, an international team of scientists has discovered an equally massive supercluster lying in the vicinity of Shapley (around 800 million light-years away). 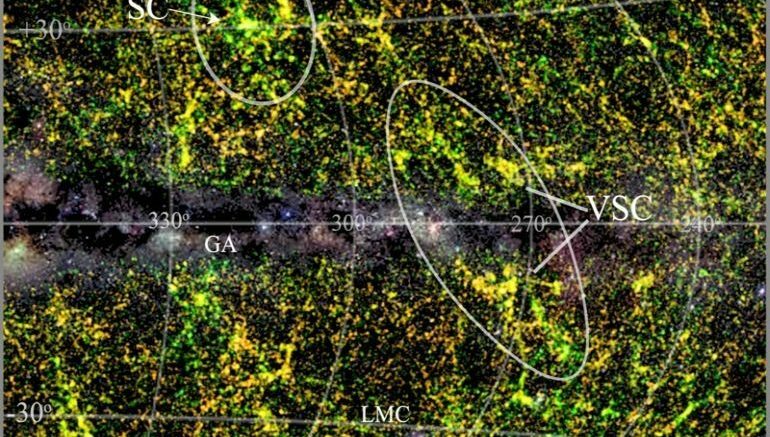 The research, conducted by astronomers from Germany, Australia, South Africa, Netherlands as well as two from the Max-Planck-Institut für extraterrestrische Physik in Garching, is the first to reveal the existence of the Vela supercluster, which appears to take up an even larger area in the sky than its more famous counterpart. The structure likely escaped notice for so long, thanks to its location behind the galactic plane of the Milky Way. The region is further made obscure by dust and smaller stars. Believed to be at least as big as the Shapley, the Vela supercluster could possibly have an influence on the movements of nearby celestial bodies. According to the researchers, it was discovered via multi-object spectroscopic observations of several thousand partially-obscured galaxies. I could not believe such a major structure would pop up so prominently. This discovery shows that the Vela supercluster has a significantly higher matter density than average, making it a prominent large structure… We already have good indications that the Vela Supercluster is embedded in a large network of cosmic filaments traced by clusters, providing insight into the even larger-scale structure embedding the Vela Supercluster. With the future multi-wavelength programme we hope to unveil its full influence on the cosmography and cosmology. Despite the impressive discovery, the scientists have before them the arduous task of determining the mass, exact location as well as influence of the newly-discovered Vela supercluster on the various objects of the Local Group.